Mid-September 2015 found me with some planned time off in between jobs. 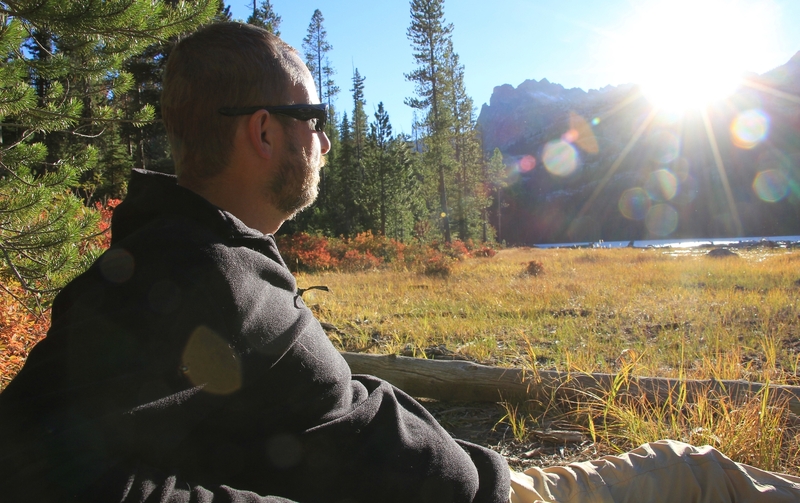 September is our favorite hiking month so Jason put in for some extra vacation time. 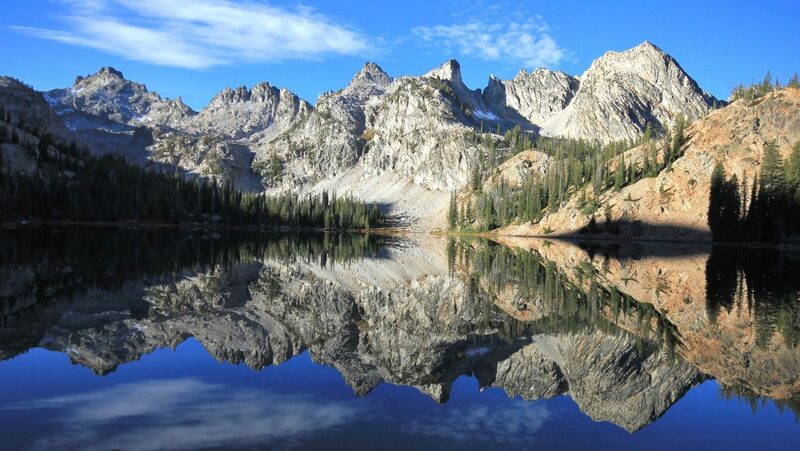 My time off came at the expense of a missing paycheck prompting us to agree on an inexpensive vacation spent backpacking and hiking in Idaho’s Sawtooth and White Cloud wilderness areas. 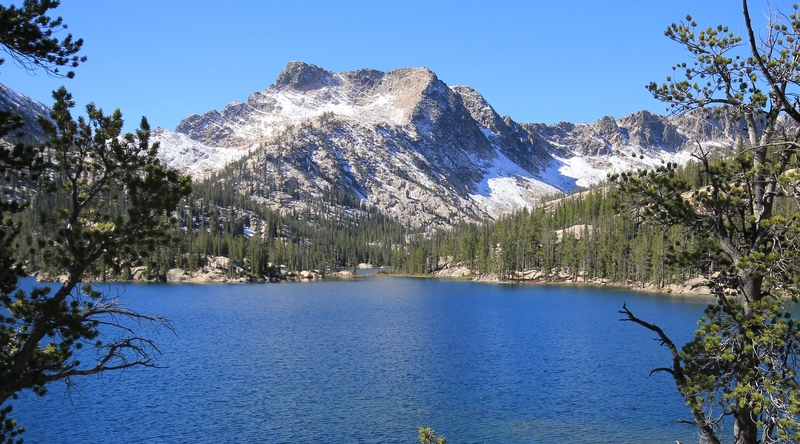 We’d do a three day backpack to Hell Roaring and Imogene Lakes, a day hike along a ridge line in the newly designated White Cloud Wilderness, a three day backpack on the Alice Lake Loop, and end with a day hike into Island Lake high in the White Cloud Wilderness. 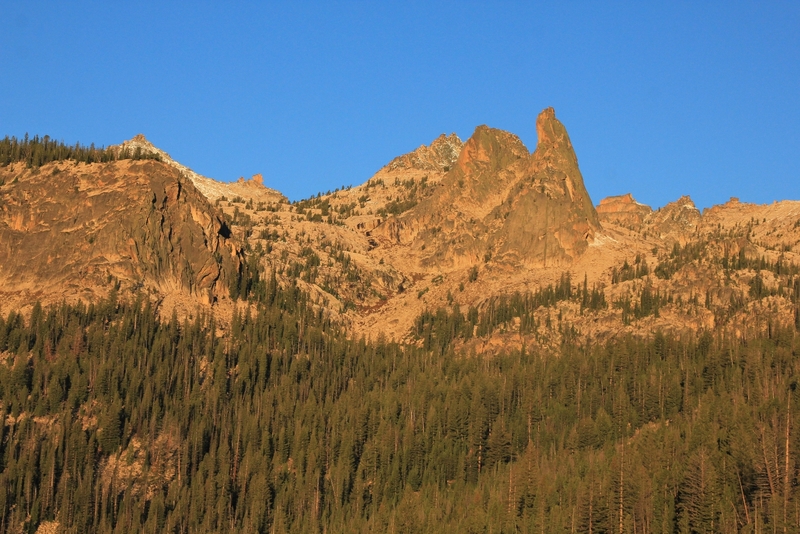 Saturday September 19: We had gorgeous weather for the drive from our home in SE Washington to Stanley, Idaho. Temperatures were in the mid-60s with full sun and there was a fresh layer of snow on the mountain peaks. 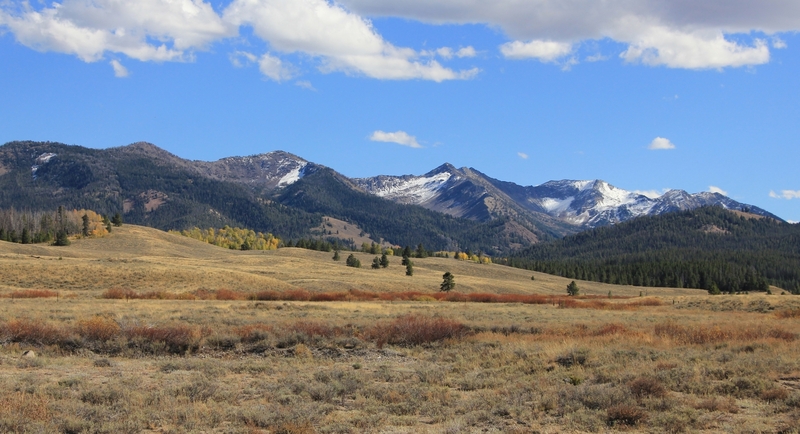 The area had seen several days of valley rain and mountain snow just prior to our arrival, but conditions had turned and the long range forecast was for a week of perfect weather with highs in the 60s-70s and lows around freezing in Stanley. 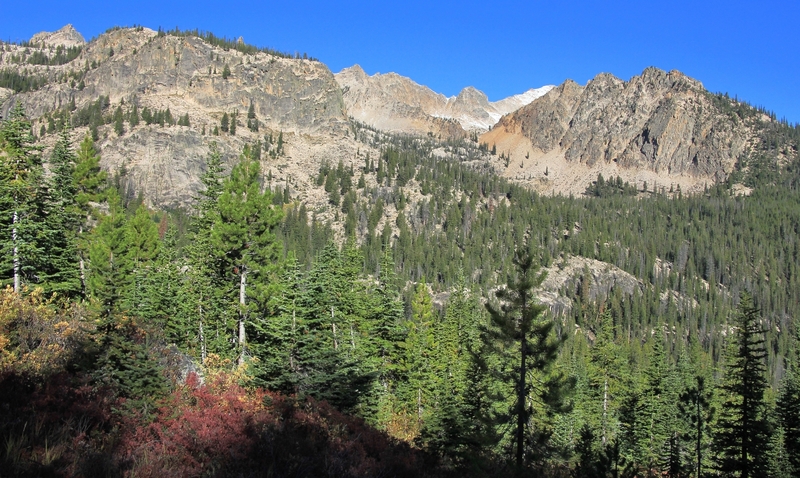 The fresh snow on the Sawtooths was striking and quite beautiful. 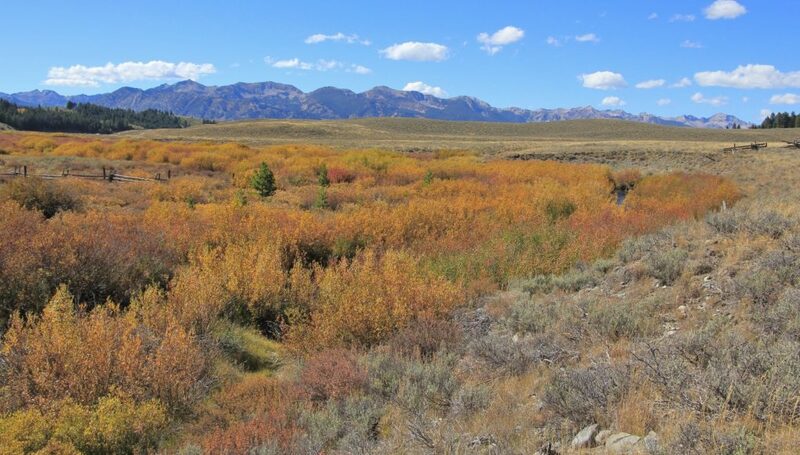 I also noticed that the fall colors appeared to be peaking with yellow aspens dotting the landscape. I was like a kid at the gates of Disneyland. 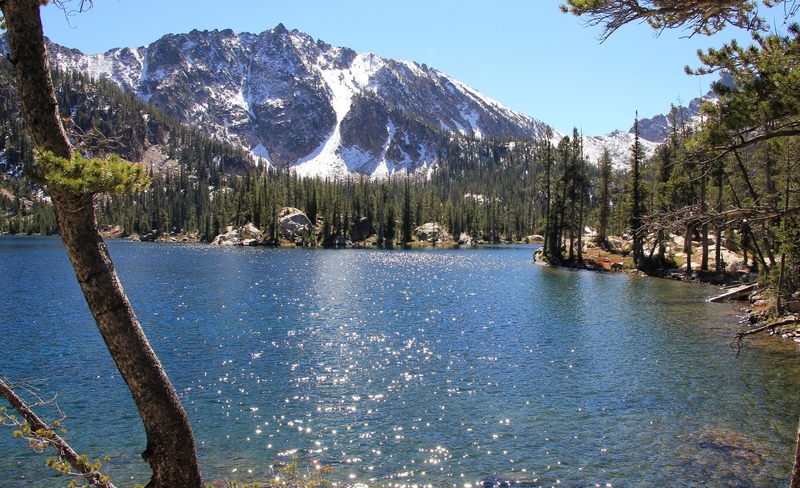 From Stanley, we drove south to the Hell Roaring Lake Trailhead where we found only about half a dozen cars. While making a few last minute additions to our packs, I started chatting with some men waiting at the trailhead sign. They were a group of six from the Olympia/Puyallup area who do a big yearly trip together. 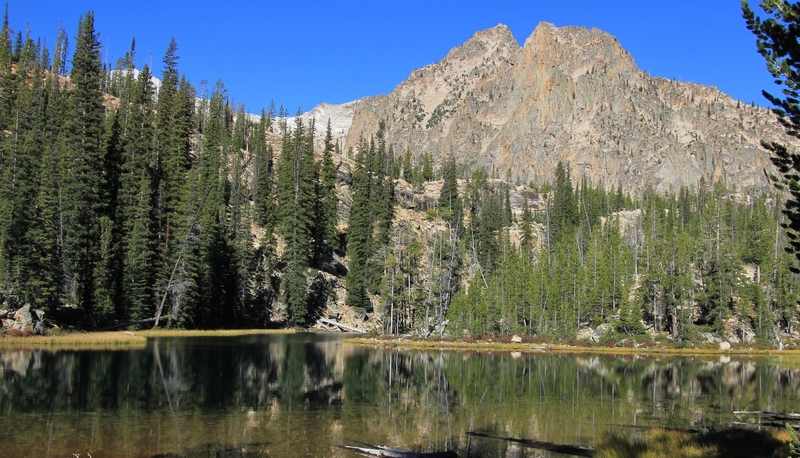 They had never been to the area and were doing a shuttle backpack with nights at Hell Roaring, Imogene, Toxaway, and Alice Lakes. I told them our planned routes for the week (which would overlap theirs in the beginning and end) and told them I thought they were doing it the perfect way with the shuttle. It is actually the route I wanted for us, but we lacked the shuttle. Route: we started at the TH closest to highway 75 (far right in this photo). 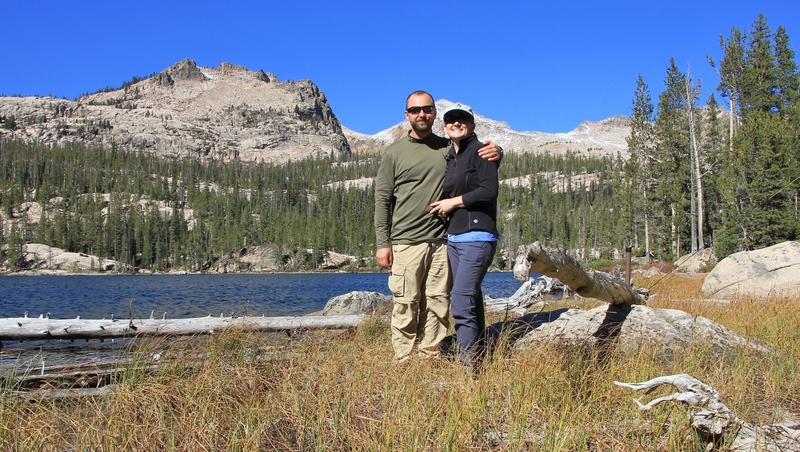 We spent both nights at Hell Roaring Lake and did a day hike up to Imogene Lake. We left the Hell Roaring Trailhead (elevation 6,796’) and began our journey a little before 3:00 with full sun and temperatures in the mid-60s. We quickly passed the Olympia boys which made me feel good since they all looked quite fit. I think our hikes at high elevation the weekend prior helped me adjust quickly. There weren’t any aspen trees with fall colors in this area, but the trail and stream were lined with bushes that were flaming red with fall colors. 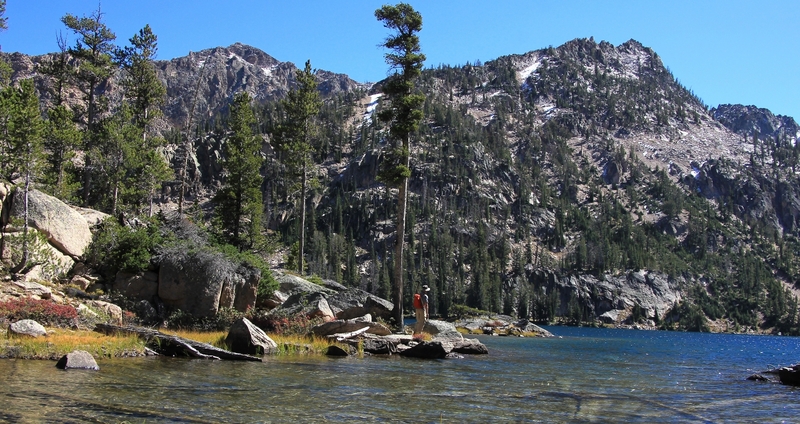 We had hiked the stretch to Hell Roaring Lake two years prior, so none of this day was new scenery for us. I won’t lie, the trail to Hell Roaring isn’t that scenic after the first mile, but the destination is well worth the unimpressive hike in. We easily climbed the first mile of trail along Hell Roaring Creek as it raced down the mountain toward the Salmon River. This is a nice stretch of trail and is where you knock out most of your climbing. We then settled in and followed along a rather pedestrian stroll through the woods. 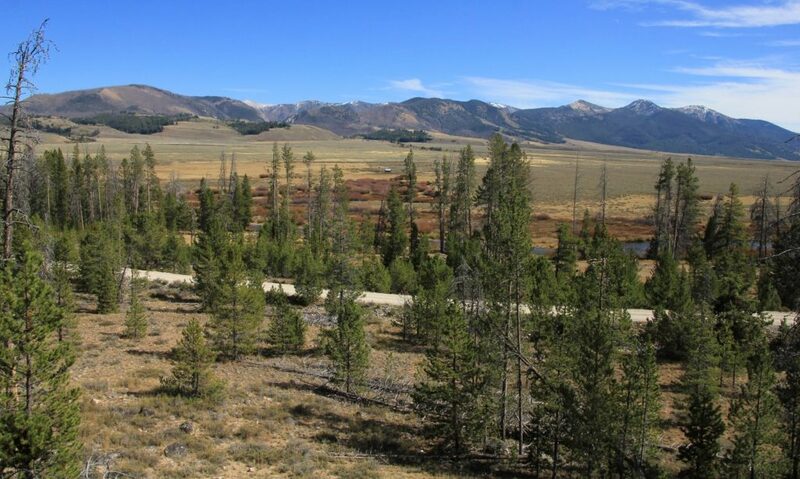 This stretch is flat and easy hiking so the miles go by quickly. 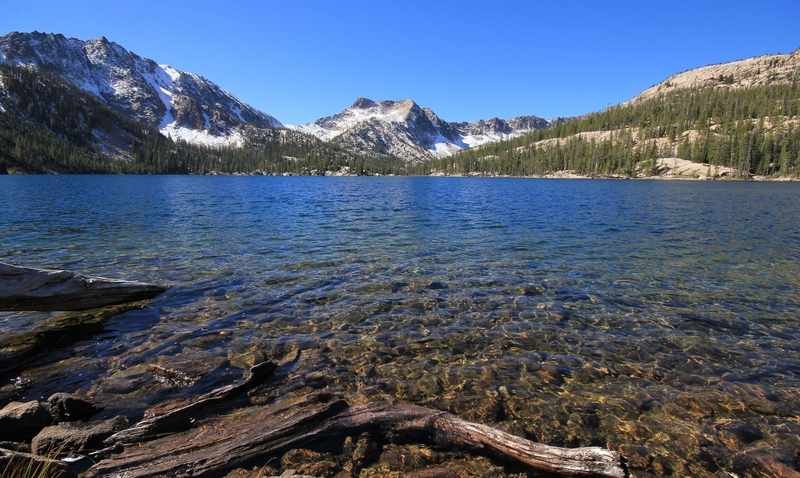 We registered at the wilderness permit station and made it to the lake right at 5:00. 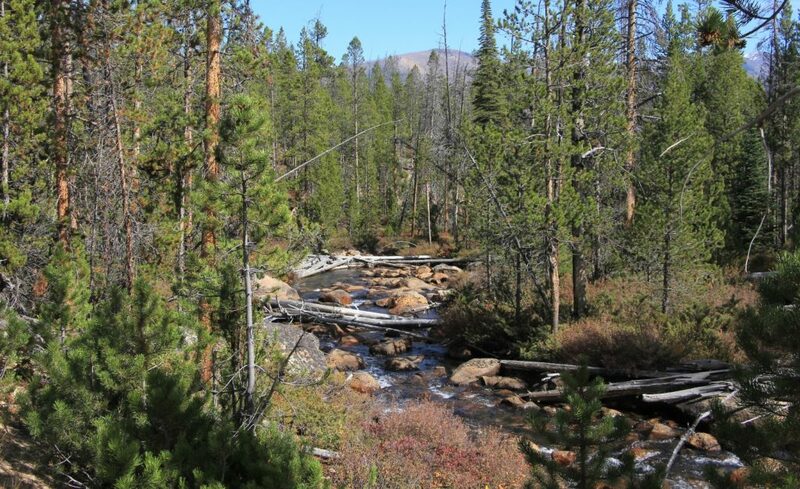 At Hell Roaring we crossed the outlet stream on a skinny log bridge and set our camp up at a gorgeous site located there at the outlet (elevation 7,416′). 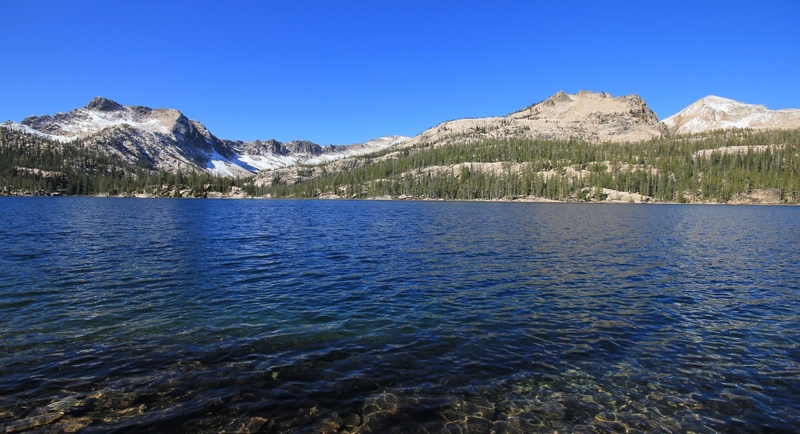 We had a great view of the lake, a nice flat site, several large rocks for “camp furniture”, and the sound of the outlet stream. Our first day on the trail had been an easy one with just 4.5 miles hiked with 620’ elevation gain. 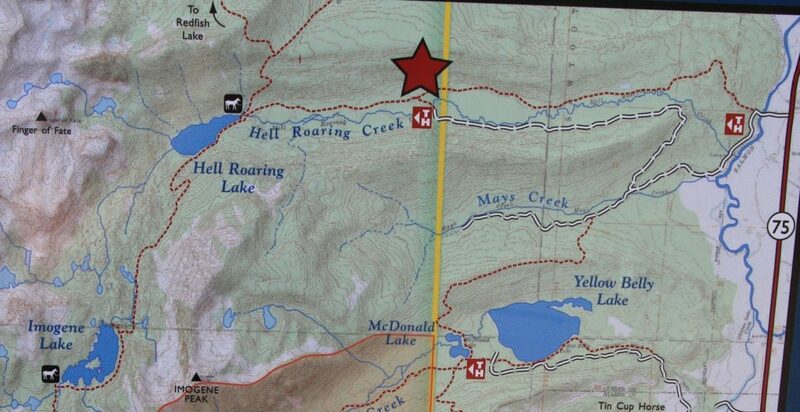 welcome to Hell Roaring Lake! We got to work setting up camp. First order of business was to get the tent set up. Then I worked on getting our beds made while Jason looked for a good place to hang the bear bag for the first time (we had always used a hard sided container in the past). It took him quite a while to find a suitable tree, but things seemed to work well once he did. After getting the beds ready, I set to work starting dinner. About that time the Olympia boys came hiking past. They all gave a friendly shout out and were impressed we already had camp set up. Dinner was Top Ramen with chicken and veggies. 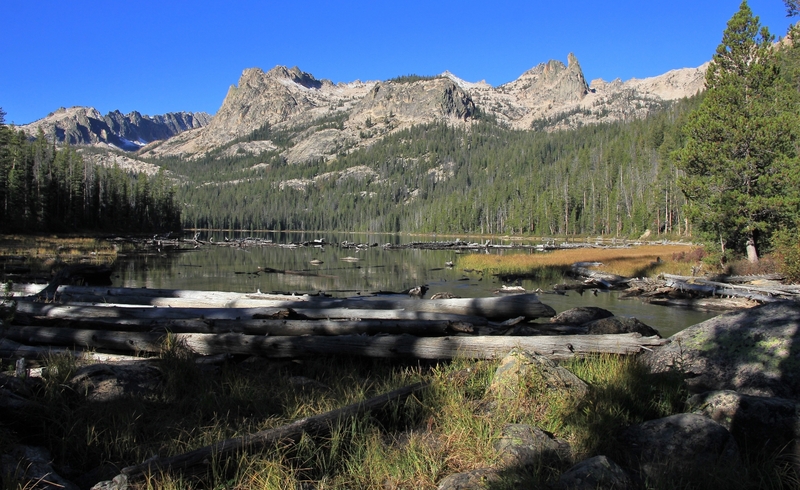 We ate dinner lakeside while enjoying the last warm rays of the sun and views of the Sawtooth peaks towering high above on the far side of the lake. 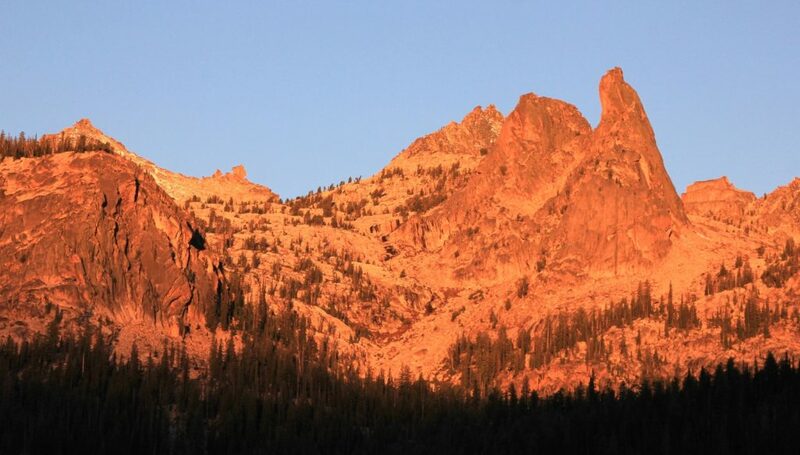 Temperatures dropped quickly after the sun set behind the mountain peaks. It wasn’t long before we crawled into our cozy down sleeping bags to read for the evening. We both used our sleeping bag liners that night and I slept in top to bottom fleece. Sunday September 20: We awoke to 28 degrees and a light frost. Jason was awake and reading before there was even a hint of dawn. We stayed in bed until a little light started to break, then we got up and started coffee and breakfast skillets by headlamp. 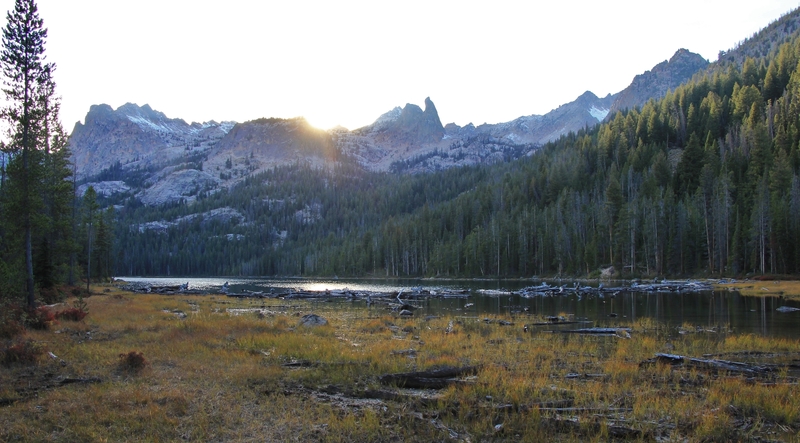 Just a few steps from camp, we enjoyed a lakeside breakfast as the first rays of light hit the peaks above the shore. I took a bunch of photos at the outlet and then started working my way around the left side of the lake for some reflection shots. During my shooting, I came upon the Olympia boys. A few of them were down on the lake shore having coffee. The others came down and we all chatted for a bit. I saw they had some nice backpacking chairs and I asked their opinion on those. Thus commenced each of them trying to sell me on the one they had. “Try mine now, it only weighs x pounds and has this or that feature.” They sounded so convincing I finally asked if they worked at REI! One of the men, looking a bit dejected, told me that his favorite chair was “whichever one is empty”—it seems he didn’t have a chair. One of the others rubbed, “that’s what happens when your pack is full of cheese and sausage.” Apparently this gentleman had started the hike with about 10 lbs worth of gouda cheese and salami in his pack. I stated that he would be the favorite person at our camp and that he was more than welcome to join us! They were a fun group of guys. We’d see them a few days later as they were ending their adventure and as we were starting our backpack into Alice Lake. 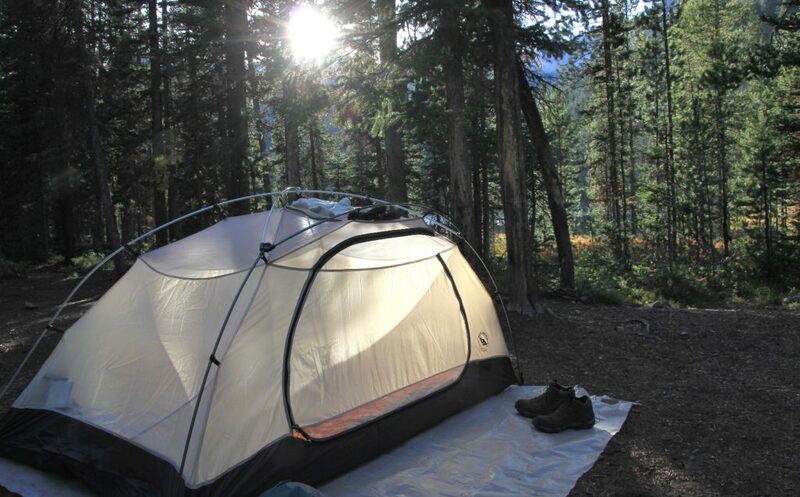 Back at camp, we tidied up our home-away-from-home and arranged our day hiking gear into our REI Flashpacks. 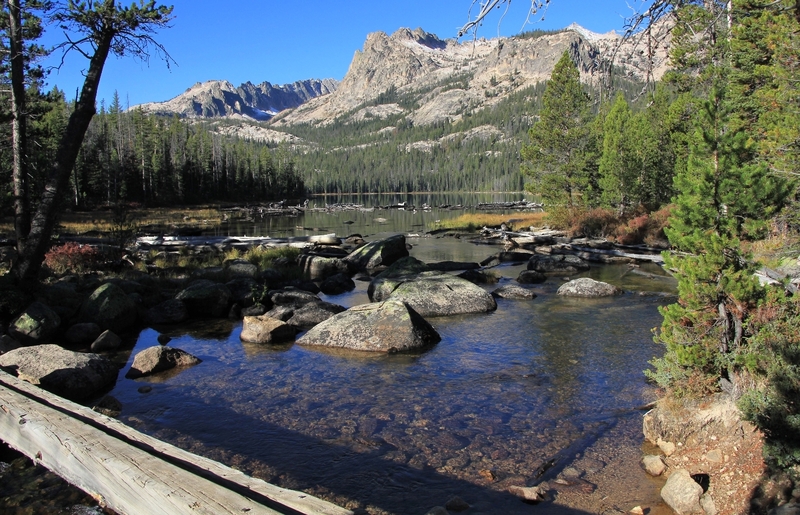 Then we headed out to Imogene Lake. 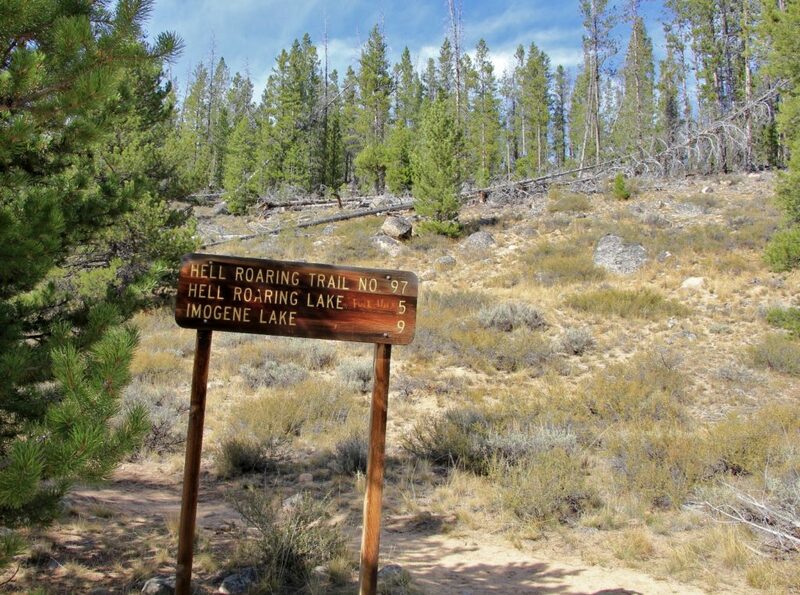 The trail follows along the south (left) side of Hell Roaring Lake for its length before heading uphill. 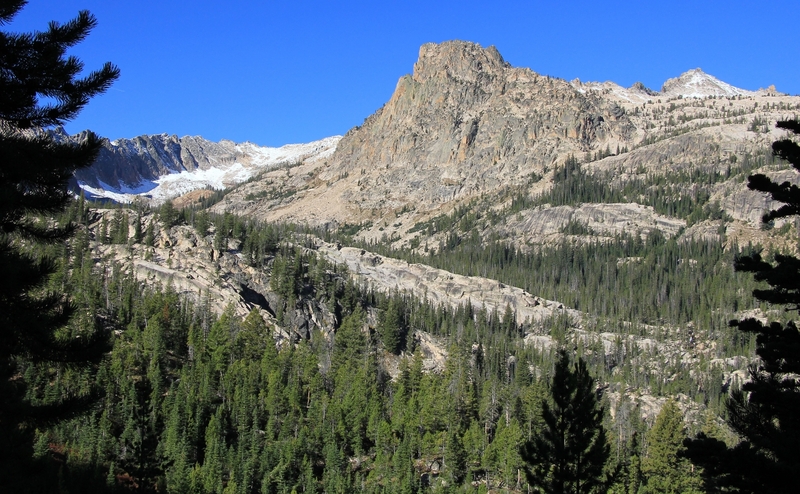 From there it was a steady ascent most of the way to Imogene Lake. The trail had good tread and it never got too steep in any spot. 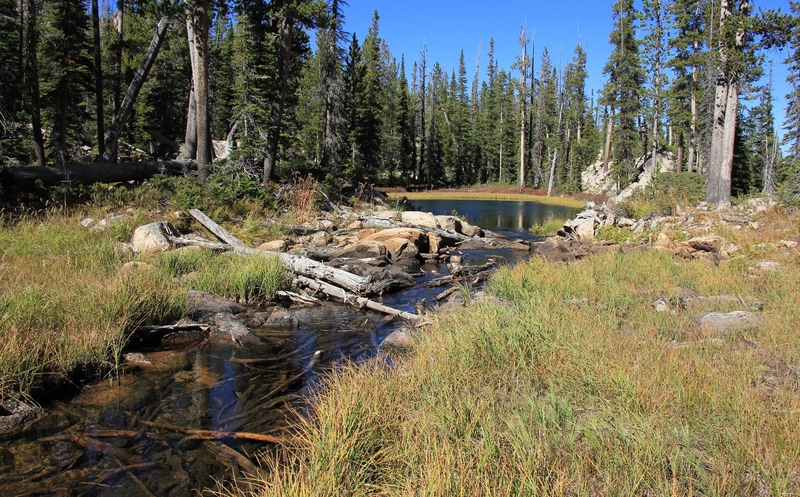 There were a few minor stream crossings, but they were all bridged except for one easy crossing down at Hell Roaring Lake. 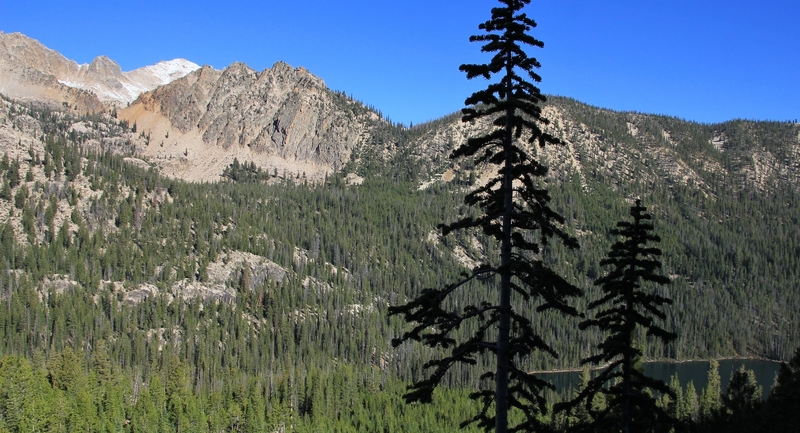 Soon after starting the climb out of Hell Roaring, good views of the Sawtooth peaks around Finger of Fate opened up making it a beautiful climb. Roughly half way up the trail, we passed a group of five middle age to older men backpacking out after a few days camped at Imogene. 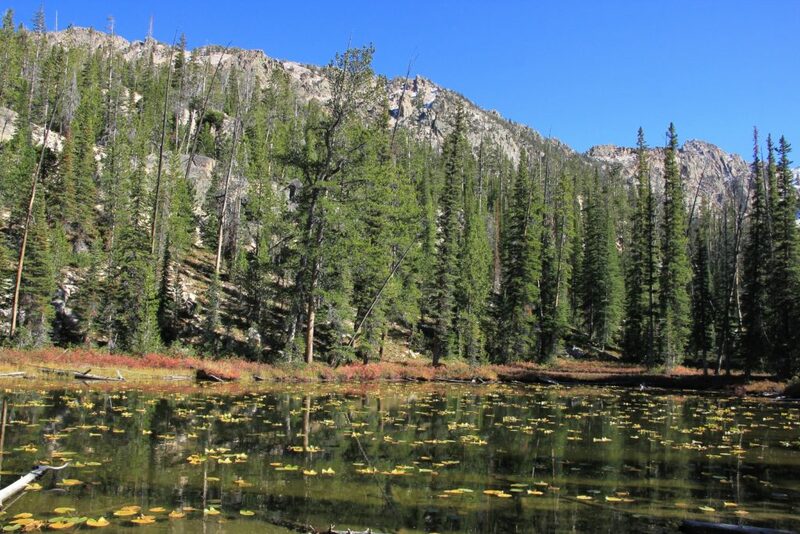 About 25 minutes before reaching Imogene we came to a cute lily pad pond and shortly after that a beautiful little lake. Both had nice views of the surrounding peaks. 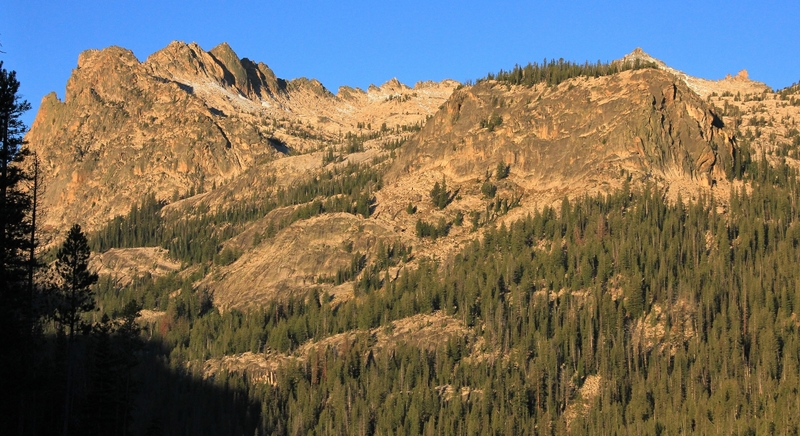 Then it was one final climb before topping out at the northern shore of Imogene Lake at 8,436’ elevation (4 miles and a climb of just over 1,000’ from Hell Roaring). Jason set to work getting his fly rod put together while I started snapping away with the camera. Imogene is a large lake roughly a mile long. It was absolutely stunning, but one of those places where I found it hard to capture the vast beauty and size of it all. There were nice fall colors along the shoreline and it was a beautiful September day. 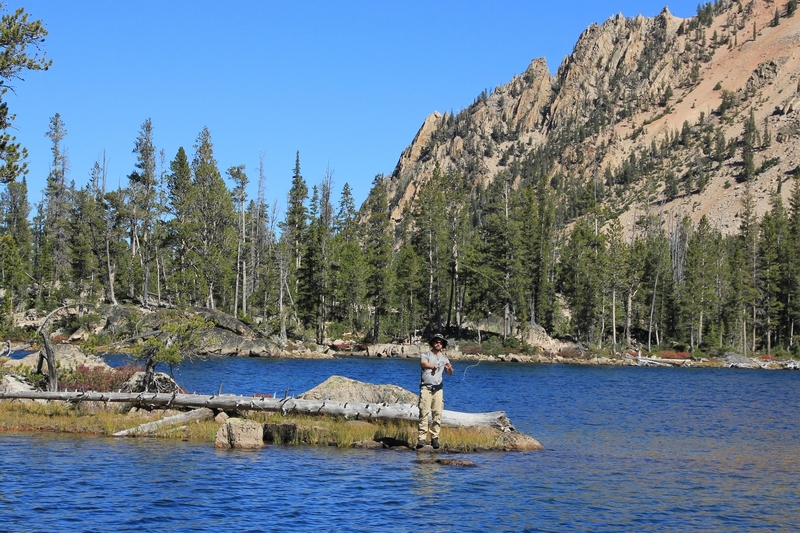 Conditions were breezy, which made fishing a challenge, but temperatures would top out somewhere in the low 60s and the sky was a beautiful blue. The lake was quiet and peaceful with mergansers playing off shore. 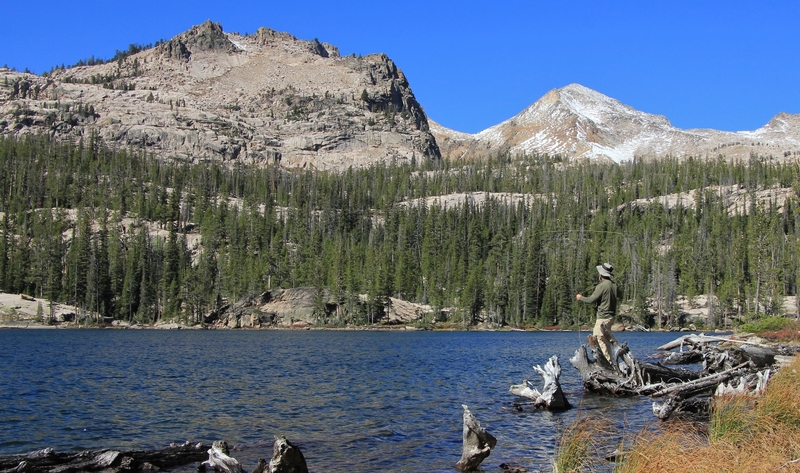 Jason began fishing around some logs at the northern tip of the lake near where the trail from Hell Roaring came in. Throughout the afternoon, we worked our way across the outlet and the northern half of the western shore. The trail was hard to follow in places, but was easy enough to eventually find. The outlet stream was lovely with a small pond off of it. The shoreline alternated from cliff areas above the water with great views to lovely little coves. 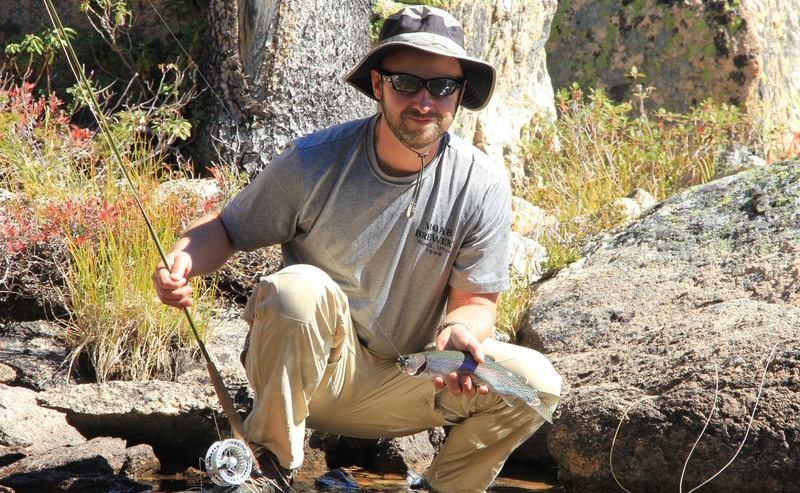 Jason’s fishing highlight was a beautiful rainbow trout caught on the western shore—it gave quite the fight. 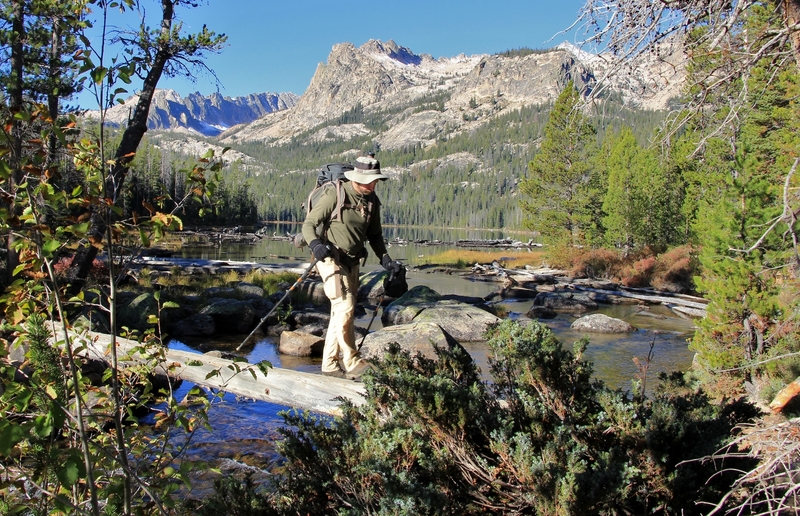 No doubt the recent snows had the fish sensing another long winter wasn’t all that far away. Once again we saw the Olympia boys. 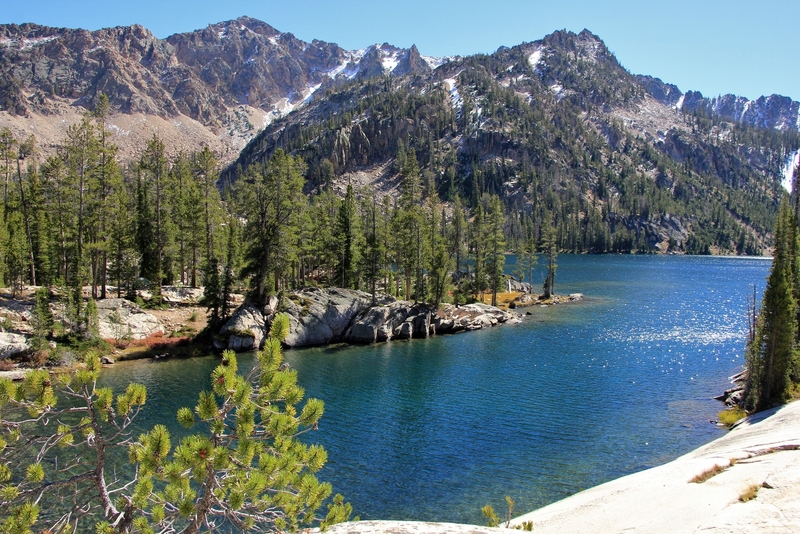 They had arrived at Imogene and were headed for the peninsula where they had heard there were good camp sites. We started the return hike to Hell Roaring around 3:00 and had an enjoyable hike back. Temperatures were perfect and it was a great time to be on the trail. 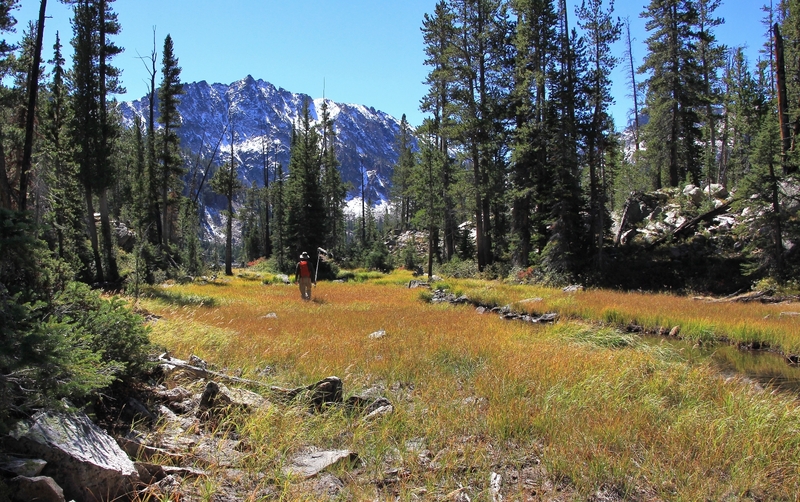 We passed a lone man leading a couple pack animals in for a total of 3 groups seen on the trail that day. We arrived back at camp around 5:00. 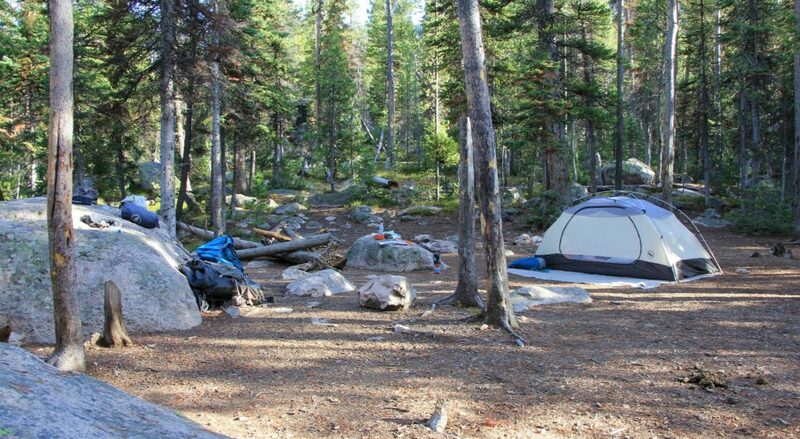 We saw a tent tucked back in the woods as we first bottomed out at the lake and later in the evening I saw a man and dog along the northern shoreline across from our camp. One party of two backpackers passed by later in the evening on their way out. That was it for traffic, it was a lovely and quiet evening on the lake. We did our camp chores and once again had dinner along the lake. As the evening started to cool, we had a cup of hot apple cider and soaked in the last of the sun’s rays before it disappeared behind the peaks around 6:30. We stayed up for a little longer before retreating to the warmth of our sleeping bags with a good book as temperatures continued to drop. 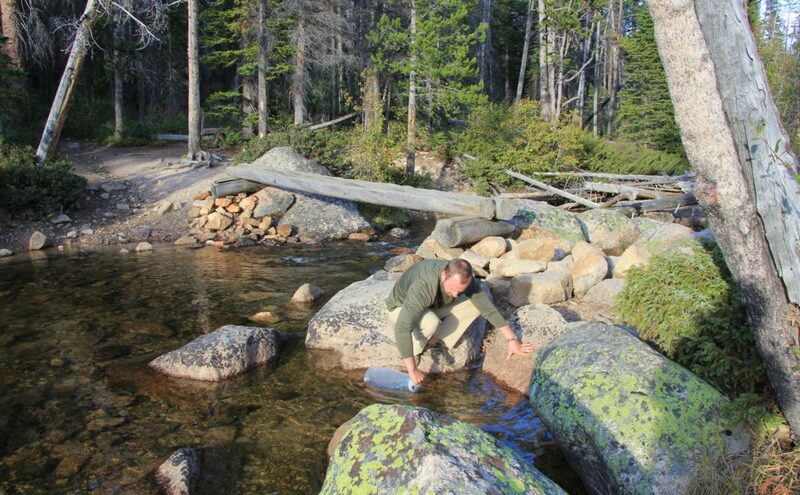 Monday September 21: It had been another quiet and peaceful night at Hell Roaring Lake with the gentle sounds of the outlet stream in the background. Once again, Jason had us awake before daylight. Conditions were a little warmer than the previous morning with a temperature of 36 degrees. As the dawn began to break, skies were clear and it was going to be another beautiful day. We had coffee and a breakfast of oatmeal along the lakefront. I savored every moment of our quiet mornings along the lake. Still relatively new to backpacking, it was on this trip that I realized early mornings with a cup of coffee is my favorite time on backpacks. I can think of nothing on Earth more peaceful or beautiful, making the miles of trail with a heavy pack worth every inch and ounce. We heard osprey and a little later heard and saw a belted kingfisher—not bad breakfast company. We packed up camp and hit the trail shortly after 9:30. Conditions were still cool, but it warmed up quickly and we were stripping layers within the first mile. 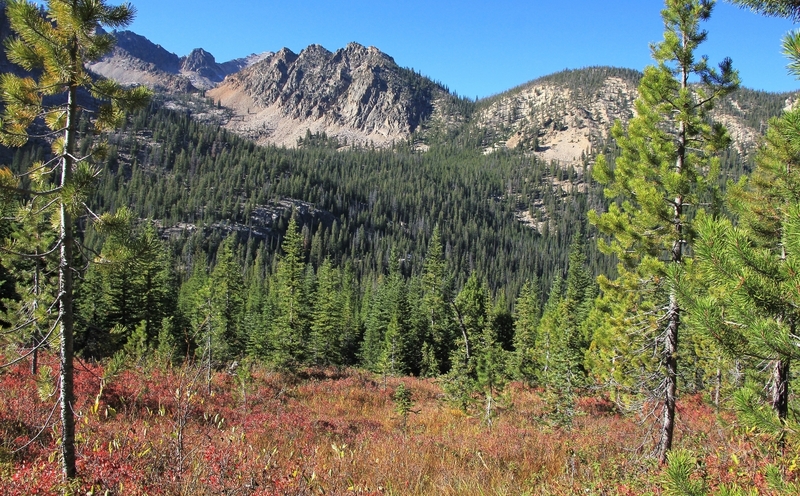 We had a beautiful hike out with all the shrubs sporting flaming red fall colors and the trail completely to ourselves. Goodbye Hell Roaring Lake- thanks for the memories! 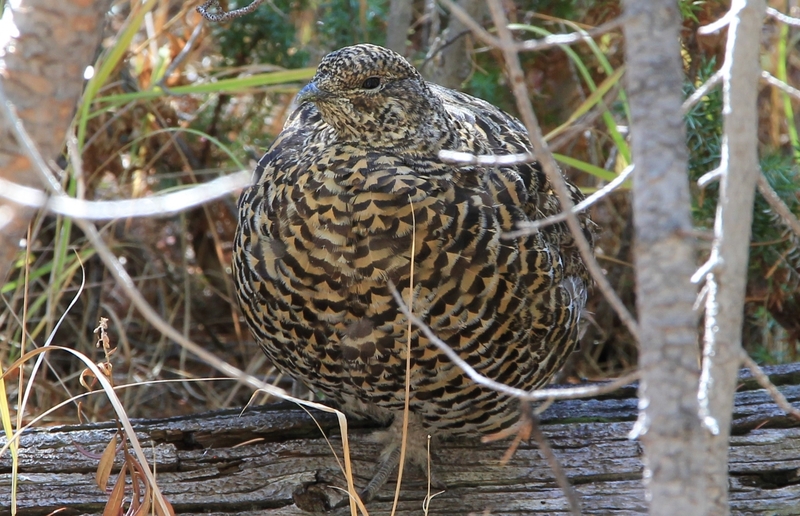 During the long straight stretch through the forest in the middle of the hike, we saw a male grouse courting three females. 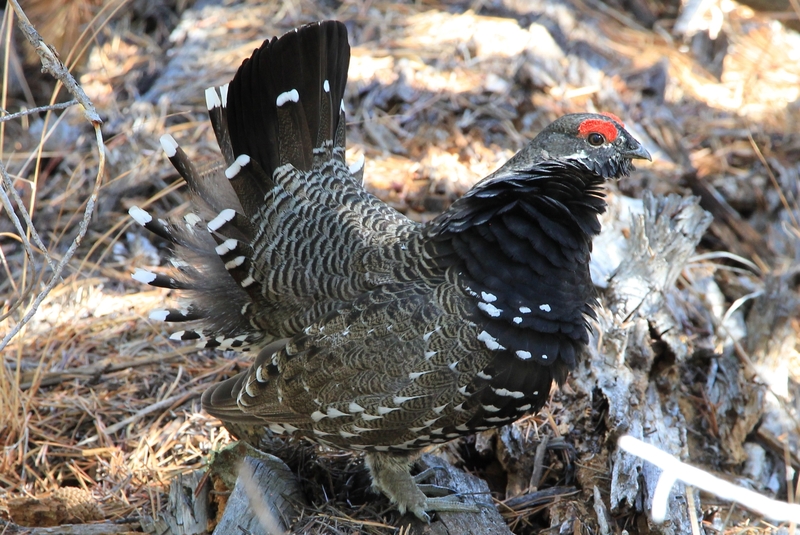 At first, we only saw the male who was right along the left side of the trail. I snapped a bunch of photos and wondered why he wasn’t scared off by us. That was when I realized there were three females sitting on a down tree just a couple feet behind us. That male wasn’t moving for nothing with those hens there. We arrived back at the truck around 12:30. Our mileage for the hike was roughly 19 miles round trip including side explorations. The only other car at the trailhead was the shuttle rig for the Olympia boys. 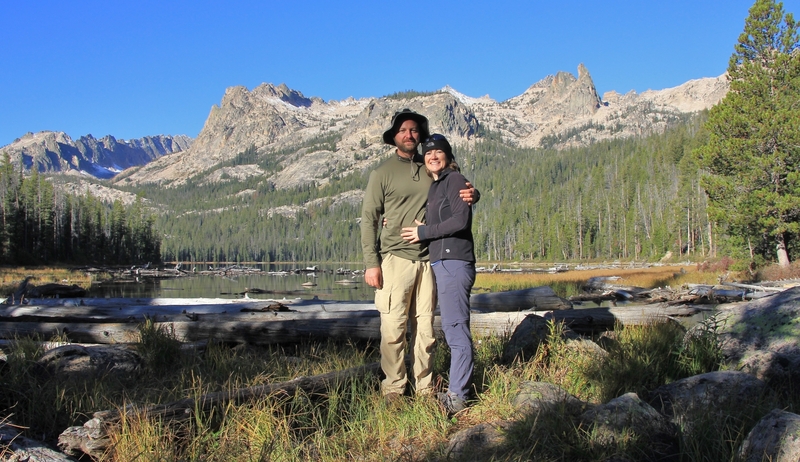 We enjoyed ice cold drinks and getting to change from our hot and dusty hiking boots to Keens. 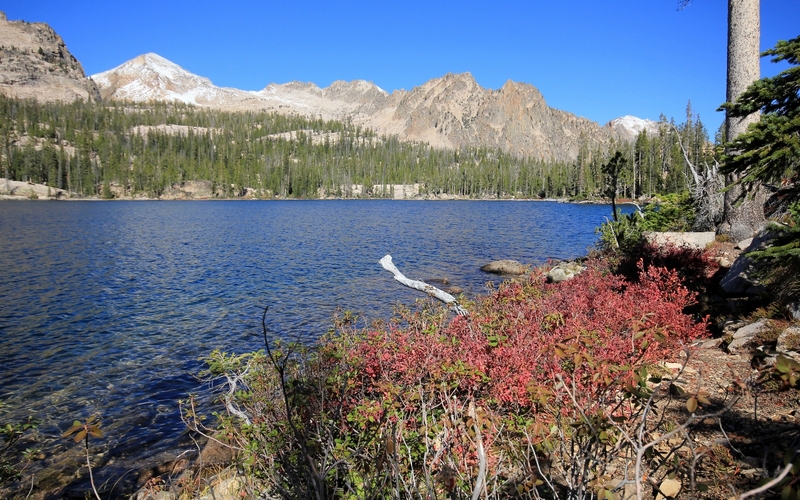 Temperatures were in low 60s at end of hike with a bright full sun and blue skies. From the trailhead we made the short drive south to Smiley Creek Lodge. We had enjoyed a good meal there a couple years prior, so we knew our backpacker appetites were in good hands. We both had bbq bacon cheddar burgers with hand cut fries and split a side salad. We had a room booked here for the night. We were early, but our room was ready so they let us check in. After lunch, we threw a few things in the hotel room then took off for a drive. By now it was 70 degrees and nearly full sun with a few puffy white clouds—another stunning afternoon. 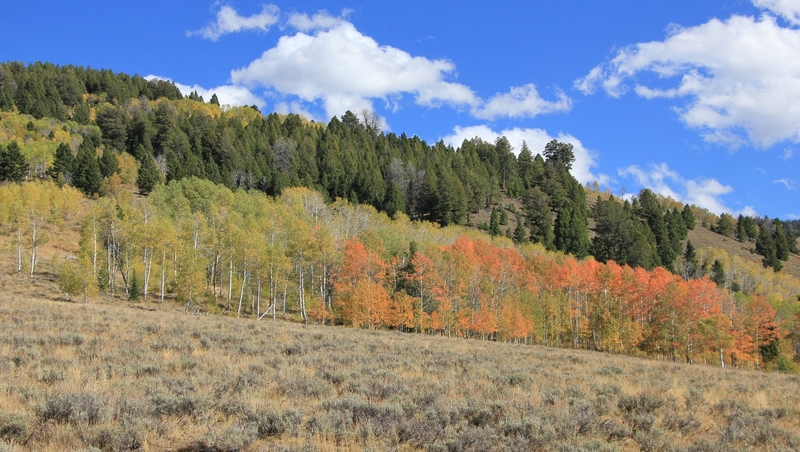 We headed south out of Sawtooth City and took the first left onto Pole Creek Road trying to follow some fall colored aspens. We ended up seeing a sign for the Historic Pole Creek Guard Station anded decided to check that out. It was only 3 miles up what appeared to be a good gravel road so we made the drive. We had some good views into the White Clouds and nice falls colors. We took the short interpretive walk around the old guard station which operated in the early 1900s. This was a delightful little stop that I would recommend if you are ever in the area. After that we continued south on highway 75. Just before the highway started to climb toward Galena Summit, I pulled over and hiked over to some yellow and red colored aspens for some shots. 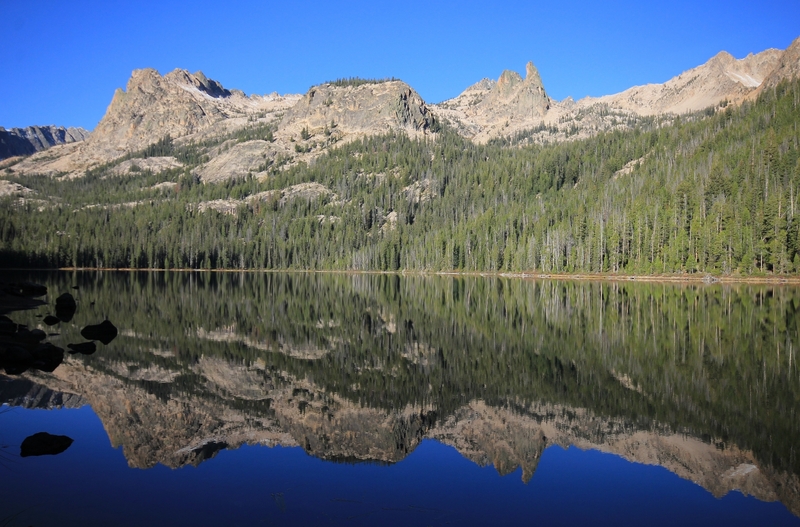 Next we headed north on highway 75 to Alturas Lake. 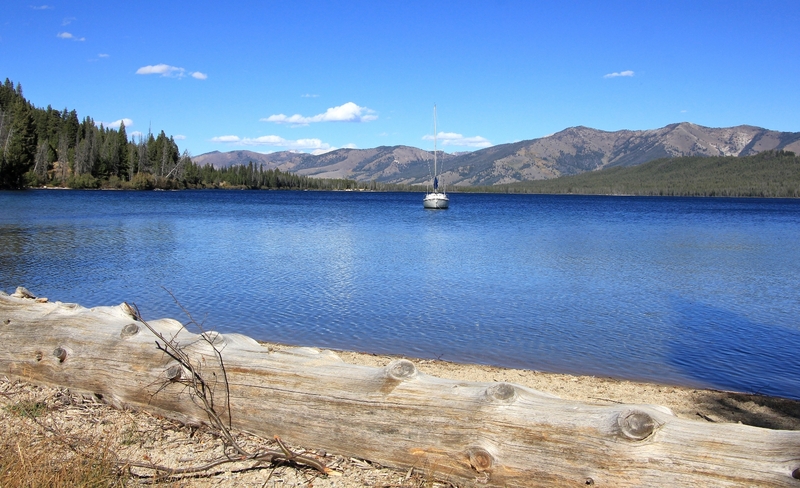 Here, 2 of 3 campgrounds were closed for the season and the lake was quiet despite the beautiful weather. I drove to the end of the lake and got out for a few photos at the beach area. From there we headed back south toward Sawtooth City. North of town, there is pullout on the west side of the road with a sign describing Sawtooth City. On the south end of that pullout we turned onto road 204. 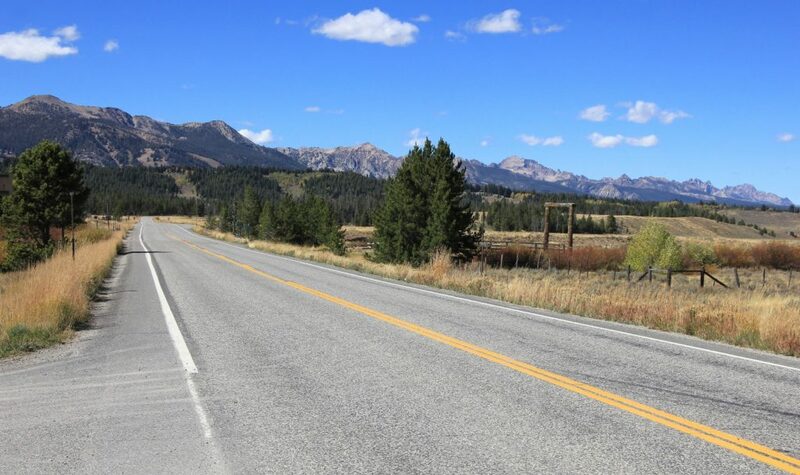 We followed this quiet road just over 2 miles to old Sawtooth City. Here there were a few log cabin structures in various stages of decay- none impressive that we could see. 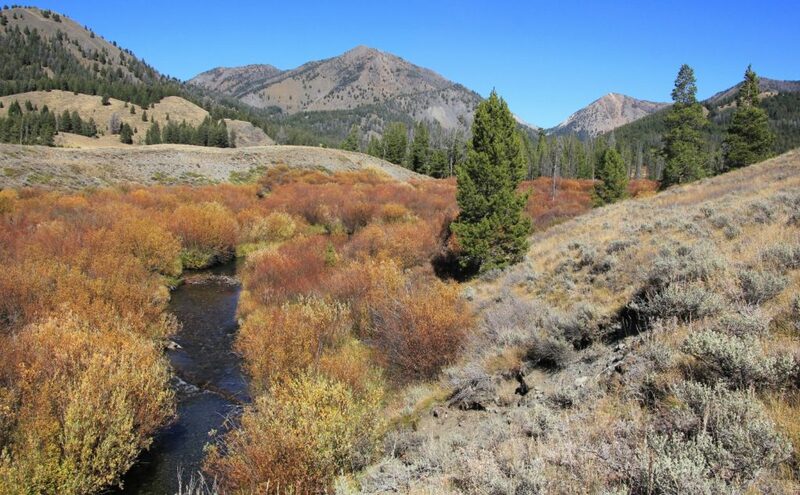 Gold was discovered here on Beaver Creek in 1879. 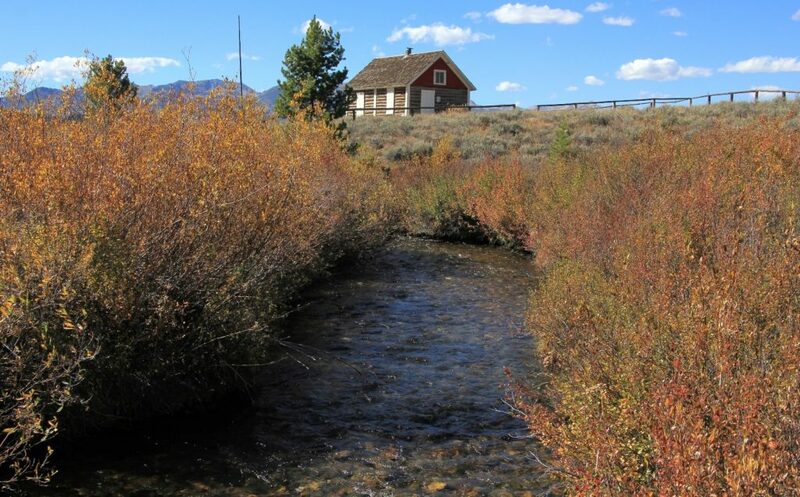 By 1882, Sawtooth City had three saloons, two restaurants, store, laundry, assay office, blacksmith shop, quartz mill, and sawmill. One disaster after another led to suspension of the work there in 1892. 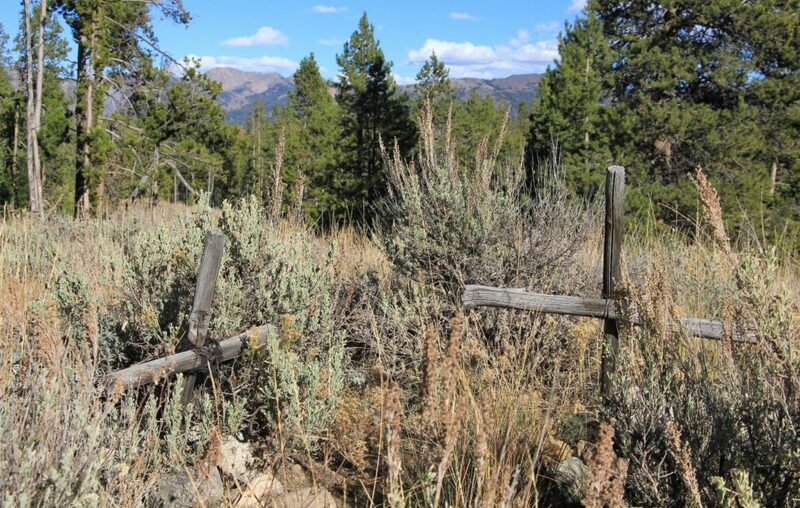 While driving back toward the highway, we looked for the old pioneer cemetery. It was the first left hand turn (unsigned) past the old city. The road looked rough, so we pulled over and walked the short distance up the road. There weren’t any signs marking the cemetery, just a half collapsed fence that marked the boundaries. 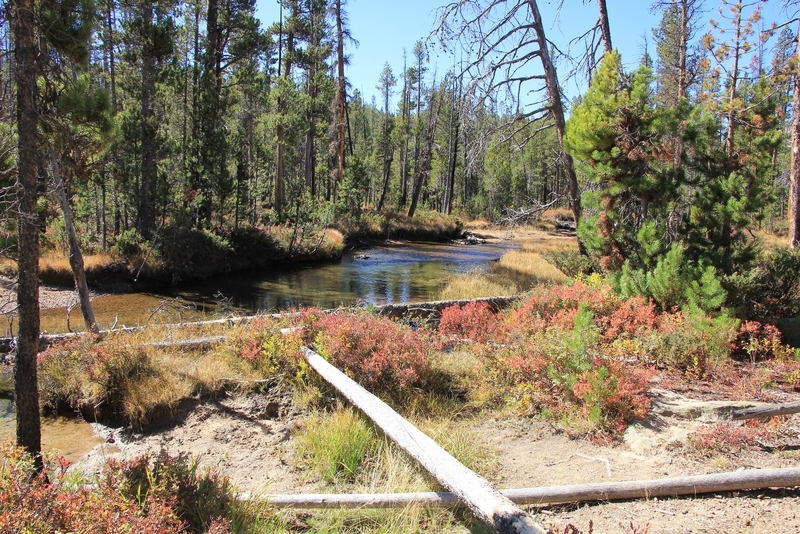 Here, among the rocks and pines were 24 (our count) very crude markers- likely dating to the 1880s and 1890s. Each marker was a few stones piled around a rough wooden cross. Most of the crosses were falling apart. A very humble and forgotten cemetery indeed. Back at Smiley Creek, we got to the snack bar just before closing. Jason had 2 scoops of ice cream and I had a waffle cone—sweet rewards for a successful backpack. Up in our hotel room, we enjoyed our first showers in 3 days and soft, comfortable beds. 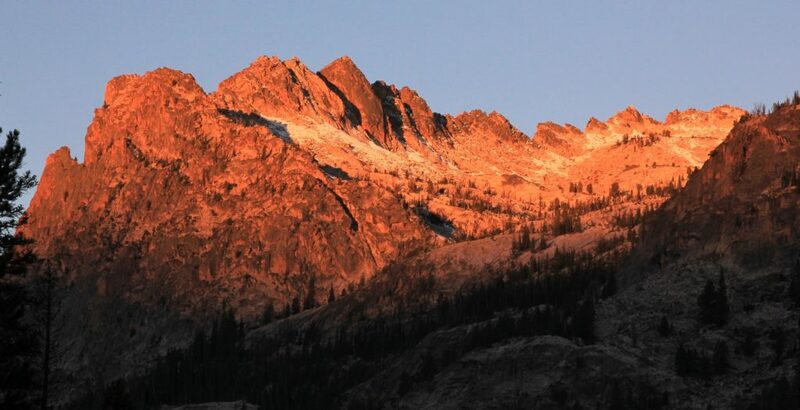 We’d enjoy a good night’s sleep before hiking in the newly designated White Cloud Wilderness the following day. A nice young woman at the restaurant had recommended the off route hike and said it was a favorite with locals. 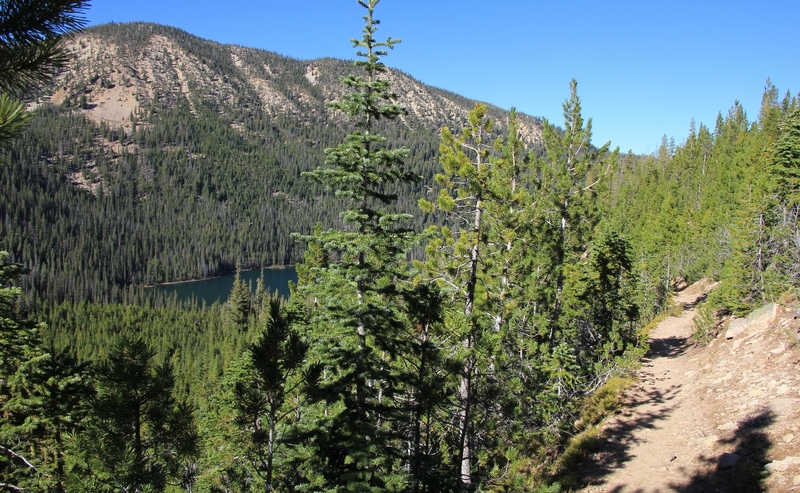 Directions to lower Hell Roaring Lake Trailhead: From Stanley, Idaho, follow highway 75 south to Decker Flat Road (FS #210) and turn west. Cross over the Salmon River and turn left . Go about 0.3 miles to the lower trailhead which his limited parking. 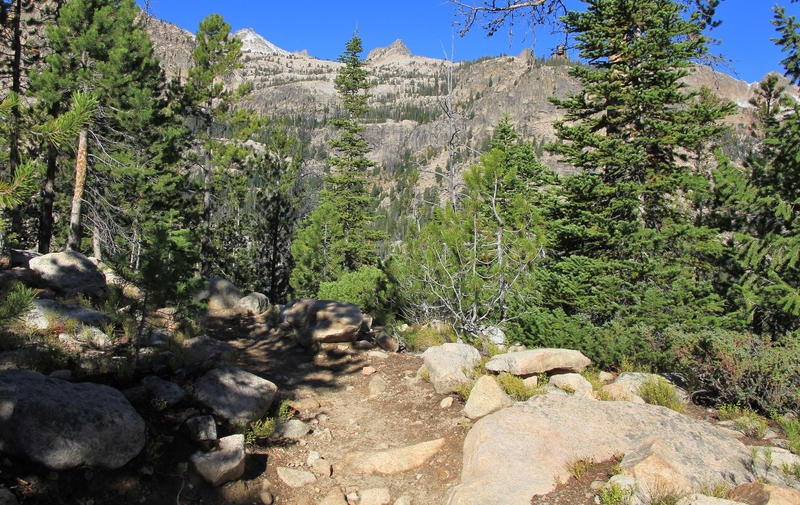 There is an upper trailhead that we have not driven, but have heard is extremely rough. 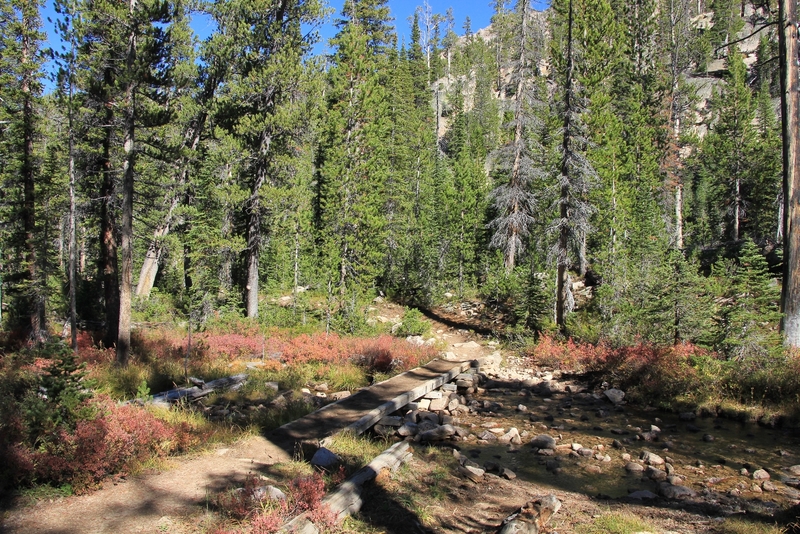 Those with 4WD and high clearance can continue 1.5 miles to Mays Creek junction and then follow FS Road #315 an additional 1.5 miles to the upper trailhead. 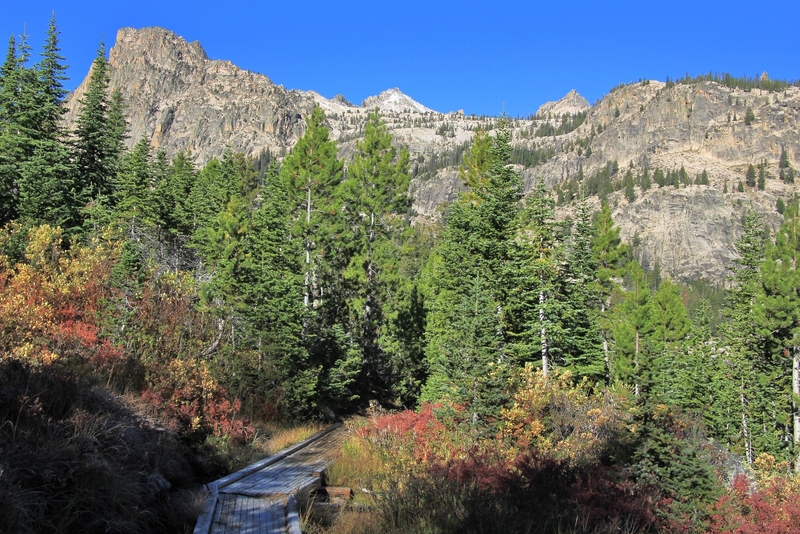 This would cut off some of the pedestrian forest hiking in the middle; however, you’d miss the first mile of trail that follows along Hell Roaring Creek as it drops in elevation toward the Salmon River. 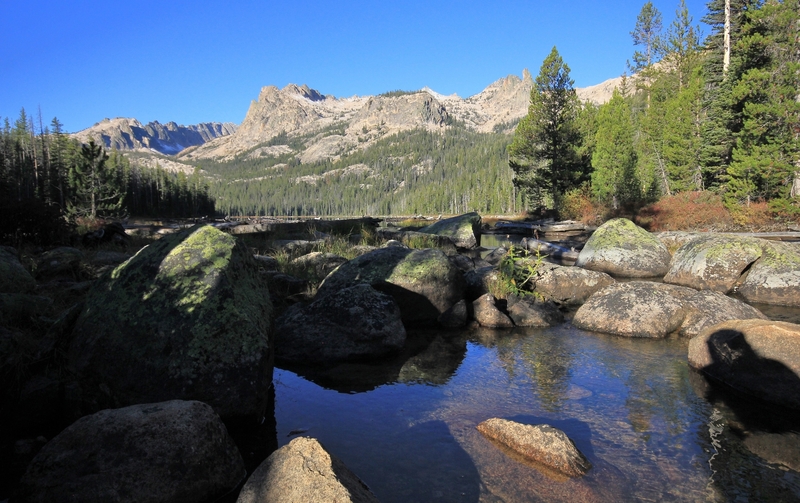 I really enjoyed reading this article, as I make plans to start hiking into the Sawtooths. Thanks for sharing your experience. Thanks for the nice comments David. 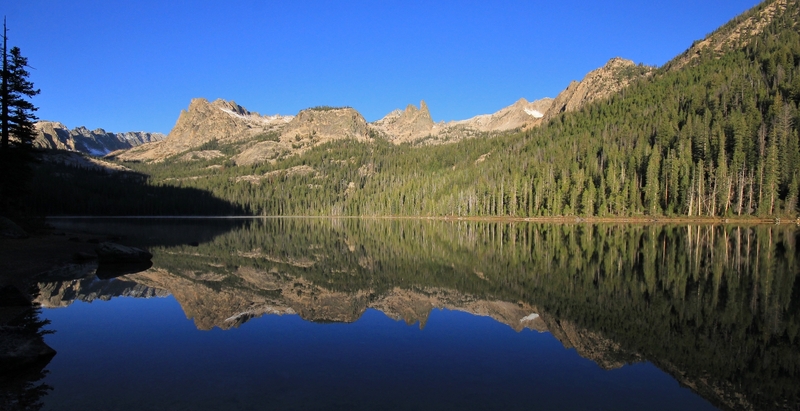 The Sawtooths are a favorite of ours- you simply can’t go wrong with any of the trails! Enjoy!